Epileptic Seizures in Sea Lions – Neptune 911! Sick and confused sea lions convulsing with seizures are being found in increasing numbers along the California coast, suffering from what Stanford University scientists say is a form of epilepsy similar to the kind that attacks humans. The culprit is a neurotoxin found in algae blooms, also known as red tides, that have proliferated lately along the coast for unknown reasons, scientists at Stanford University and the Marine Mammal Center in Marin announced last week in a study published in the Journal of Comparative Neurology. Besides harming and killing wildlife, the oceanic phenomenon puts humans at risk. As troubling as that may be, medical researchers believe the new findings may help them root out the causes and improve treatments for human epilepsy, according to the study published March 19. Buckmaster, the lead author, studied the brains of 14 epileptic sea lions that were brought into the Marine Mammal Center. He compared them with tissues from nine animals that died of other causes. The pinnipeds with epilepsy had lost about 50 percent of the neurons in their hippocampus, according to the study. That’s the same thing doctors see in people with temporal lobe epilepsy, Buckmaster said. Other striking similarities with human epileptics were that damage was generally seen on only one side of the brain, and that nerve fibers carrying electrical impulses had extended into areas of the hippocampus where they don’t normally grow, he said. Temporal lobe epilepsy is one of the most common forms of epilepsy in humans. It typically begins with a seizure caused by head trauma, high fever or loss of oxygen, and eventually progresses to full-blown epilepsy. There is no cure. The similarities between humans and sea lions – which Buckmaster believes is a result of having similarly sized brains – mean new treatments that work on pinnipeds will probably work on humans. The epileptic sea lions studied were among a growing number that have washed up along the California coast every year for at least a decade. Researchers have identified the culprit as a single-celled diatom known as pseudo-nitzschia. This microscopic algae produces domoic acid, a once rare toxin that has rapidly become the single biggest biological threat along the California coast. The neurotoxin, which is found in algae blooms, accumulates in shellfish, mussels, anchovies, sardines and herring, a primary food source for sea lions. When it is sufficiently dense, it attacks the hippocampus, the brain’s memory center, and can cause memory loss, tremors, convulsions and death. 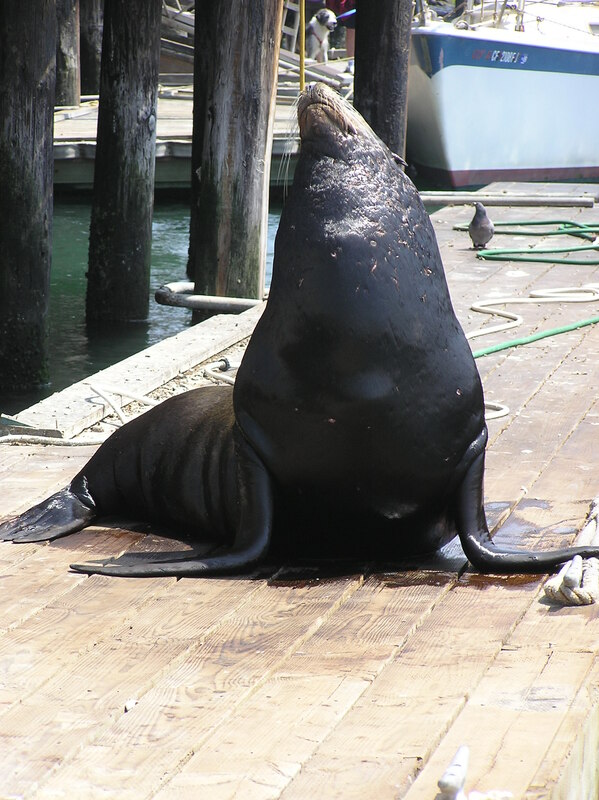 The first sign that domoic acid poisoning was causing epilepsy in sea lions was on Memorial Day in 1998 when 400 of the marine mammals washed ashore in Monterey Bay. The toxic blooms since then have generally occurred in the spring and summer, but researchers say they are now being detected at all times. Early this year, marine biologists detected the highest pseudo-nitzschia cell count ever off the California coast, said Greg Frankfurter, a veterinarian at the Marine Mammal Center. He is currently treating four sea lions for domoic acid poisoning at the Fort Cronkhite facility. Stanford researchers say only one human has ever developed temporal lobe epilepsy following exposure to domoic acid. The 84-year-old victim was one of 250 people who became ill in 1987 after eating contaminated mussels from Prince Edward Island. He died two years later of pneumonia. Three other Canadians who also ate the mussels died as a result of domoic acid poisoning but did not develop epilepsy, according to the study. There is evidence that the toxin can be transmitted to sea lion fetuses, said Frances Gulland, the senior scientist at the mammal center and co-author of the study. She said she recently treated three pups whose mothers were exposed to domoic acid in pregnancy, two of which developed epilepsy. Other marine mammals, like whales and dolphins, may also be suffering from seizures, which would cause them to drown, Gulland said. But more studies would have to be done to determine the extent of the problem. Buckmaster plans further studies on sea lions, including testing their amniotic fluid. The goal, he said, is to develop a therapy that could be used to forestall brain damage and prevent seizures.